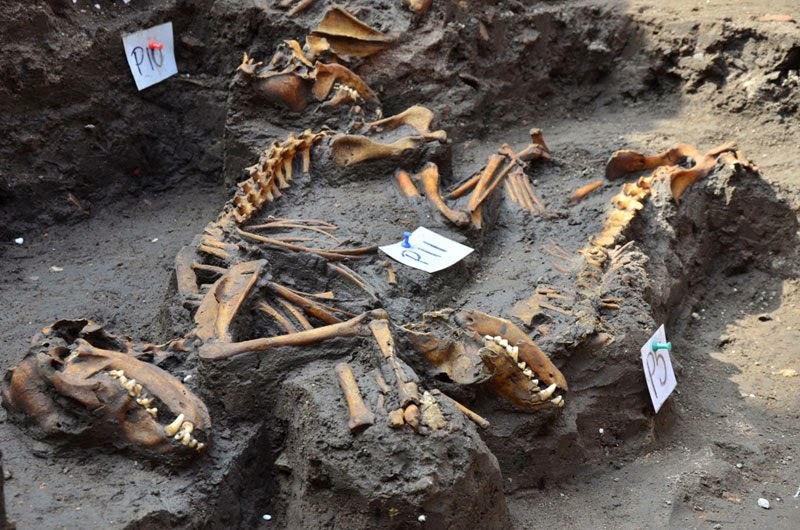 World Archeology: Aztec dog burials puzzle archaeologists. 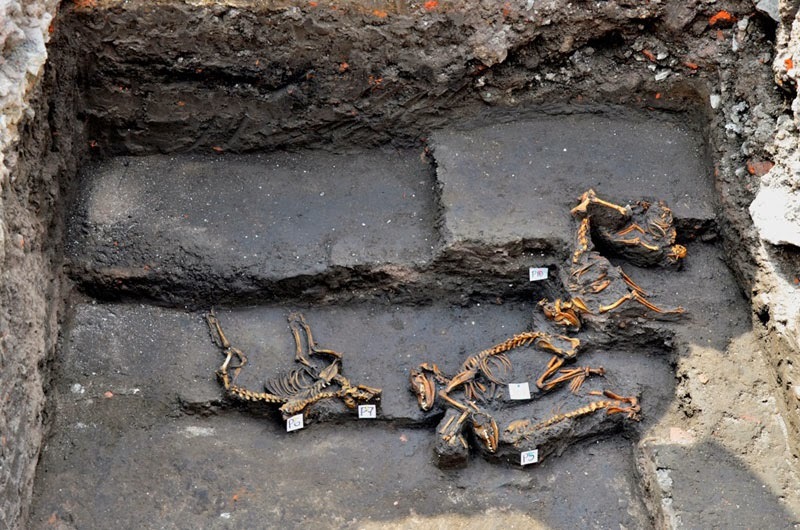 During salvage excavations in Azcapotzalco (Northwest Mexico City), archaeologists from the National Institute of anthropology and history (INAH) discovered the remains of 12 dogs. The dogs were placed there around 500 years ago, but unusually, without any apparent association to human burial – acting as a guide for the soul to the underworld, or as an offering dedicated to a temple or building. The approximate date of their burial was ascertained from ceramic material recovered, known as Azteca III and manufactured during the late Postclassic period between the years 1350 to 1520 A.D., which was the height of Aztec rule in the area, said archaeologist Rocío Morales Sanchez. He explained that they would be digging deeper to find out if any evidence exists underneath this deposit to aid interpretation. The dog skeletons will be analysed in the laboratory to ascertain the cause of death, whether they suffered from any disease or malformation. The skeletons which are in good condition do not conform to any burial pattern. Their body shape seems to suggest a common type of dog, as special breeds such as the techichi are recognised by their short legs, while the xoloitzcuintli are identified by their loss of premolars in adulthood. The group of dogs are of medium size, of various ages and have most of their teeth, except for one which has severe dental wear. The remains discovered represent the earthworks of what was the periphery of Azcapotzalco on its southern side and linked to the old quarter of the Concepción Huitznahuac. A few years ago another rescue excavation was conducted in the eastern part of the same land and at that time the archaeologists recovered and protected the remains of a household, where they also found human burials and traces of ancient canals. These finds are connected with the new discoveries of a large amount of domestic waste materials, mainly ceramics, bone needles and obsidian stone tools. INAH archaeologist Antonio Zamora said that they had also found an omichicahuaztli (percussion instrument) carved out of a human femur, as well as another musical instrument made of a dog humerus. In one clay layer they discovered the remains of an infant of about three years old from the Prehispanic era along with food waste consisting of the bones of dog and Turkey. Given the closeness of this area to the shoreline of Lake Texcoco, the archaeologists concluded that the waste was put there in order to raise the ground level to prevent flooding.